The Hoorah 2 Heroes team photo after our GORUCK workout. THE HIGHEST POINT OF THE MIDDLE OF NO WHERE — As I stood for the team photo, I double-checked myself. Keeping warm as not optional. My ruck was covered with half-frozen water after my Camelback bottle leaked. It was heavy and I didn’t want to carry it. But the letters DFQ rang in my head — don’t f***ing quit. So I picked the 26-pound pack off the snow-covered ground and put it back on my shoulders. It felt lighter now. It was my first real workout since GORUCK Light class of 1346 got its patch. I have been dealing with a sinus infection/cold/allergies pretty much since the day after it finished. It’s affected my sleep, eating, pretty much everything. But I felt better, more alive than ever before. Why was this workout so tough? 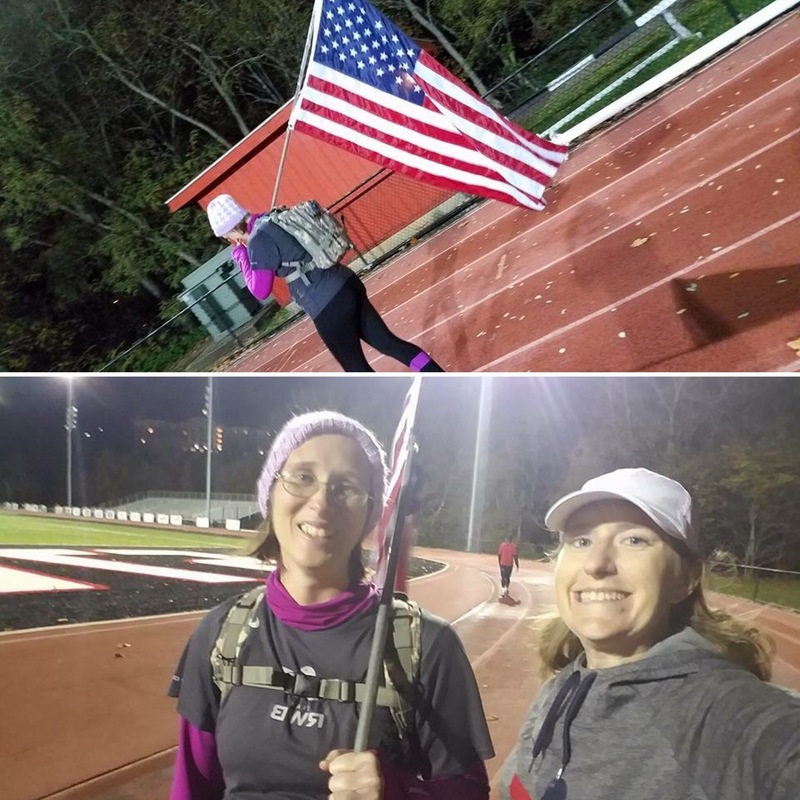 Being sick was a good thing, as it gave me time to process what I learned about myself through GORUCK. I had the legs for the workout with GORUCK training partner H2H Endurance but my sinuses and arms still weren’t ready. But the team kept going, up the hill to the highest point in our county, with a ruck and again without it. We did push-ups up an incline and down it. We finished as a team. Shivering our butts off at the flagpole with a half English/ half U.S. flag whipping in the wicked wind, we took our team photos. We laughed about dripping snot on the camera and huddling together to keep warm. It was awesome. And I’ll go back out in the freezing cold again. My GORUCK experience prepared me for the adventure. It renewed my excitement for life and physical activity. It was a great boost to my self-esteem and showed me some areas I need to improve upon. So I’ll tell you a little about my plans are moving forward into 2017. Sandy, the sandbag, and I work out after a long day at work. Cami has a broken waist strap and will be replaced as a workout pack in the near future. So let’s start with the physical aspects. I’m 40. I don’t feel it. Except for the not being able to do pull ups anymore, I feel comparable, if not better, than I did in high school. But it takes longer to recover from vigorous activity. My upper body strength isn’t where it should be. If I want to survive the zombie apocalypse or do proper pull ups, I need to seriously work on this. My sinuses, lungs, etc., have been compromised. I really want to get back to normal breathing. I’ve had this issue on and off since I started exercising in 2012. I haven’t been on my regular medication in a while, so yeah, I get to start that back up. My back and core can take a beating, but not like my legs. My back was OK up until the last 30 minutes or so of the GORUCK event, which was a six hour, one minute event. Rebuilding my core and pelvis floor will help. Now for the mental stuff. Mind over matter. A week or so after the event, I went to the gym’s pool to exercise. I sat at the edge for a bit and had to calm down. 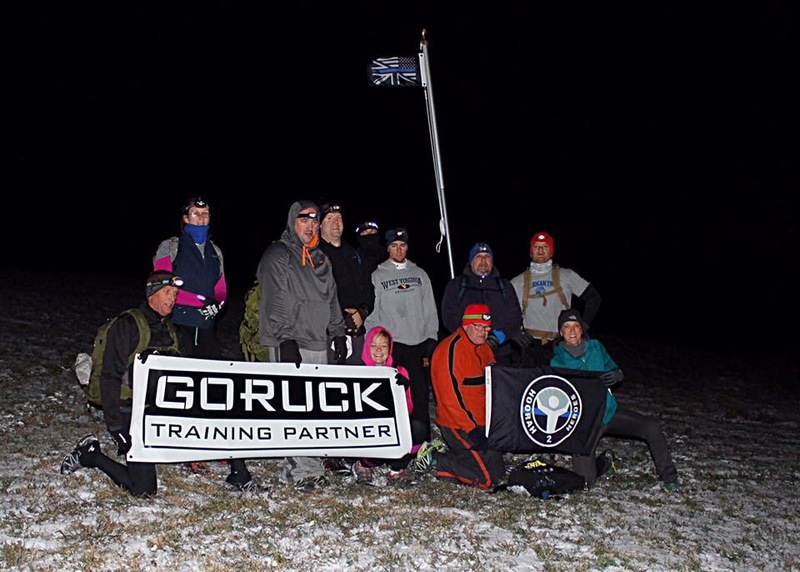 I was afraid to go back into the water, recalling the frigid water from my GORUCK experience. Once I calmed down, I was fine and have gone several times since. My body recalls stuff like that and makes it hard to do certain things. I need to convince my mind to tell my body that it will be OK so I can try new things and get back to old things I no longer do. It’s not about me (or you). In the end, you have to trust that you are doing everything you can and let your team do what it’s supposed to do. I know I spend a lot of time at night wondering how I could speak at a meeting to make things go my way or worrying about mistakes I may have made. You have to trust that you did what you can, which is really hard for me. Embrace your why. Often I do something because I feel like I have to, not because I want to. Taking on extra responsibilities at work or at home instantly comes to mind. There are other people on the team (family member, co-worker, neighbor) who can handle the job, let them do it. Also sometimes I write or do things because I want to see numbers climb on social media. Deep down, that’s not my why. In a superficial way it may be, but deep down that’s not why I started this blog. I have to get back to being authentic and true to myself. You have a voice and a job to do, so do it. When the going gets tough, I tend to let others take the led. I’m a leader of my own home. But often, I don’t act like it. Always look cool. 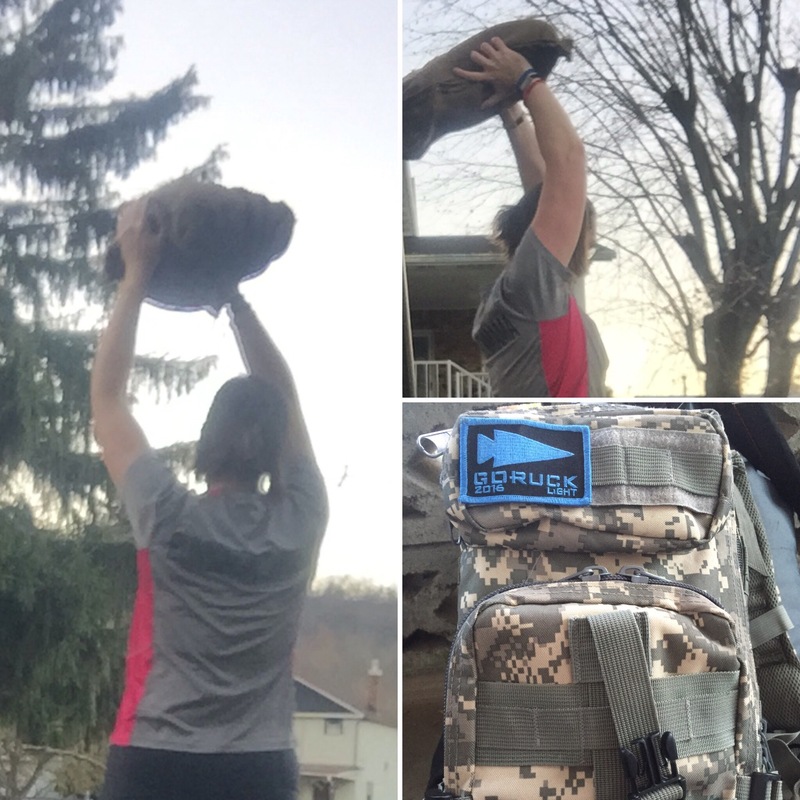 This is GORUCK’s rule No. 1. Looking cool doesn’t alway mean be a trendsetter. For me, it means to have fun and chill out. Even if you’re stressed, don’t let others know. Find a way to relax and tackle your worries another time. The biggest thing I learned: DFQ. Just DFQ. So here’s what I’ve done so far to help improve the things above. Sit-up challenge: I’m about half way through a three month challenge. I’ve done a little over 10,000 and am working toward 20,000. Doing this challenge has forced me into training mode so I can keep up with the reps. I also add push ups if I have to rest during the set or loose count. Add daily meditation: I need to retrain my mind and learn to calm down. I’ve been using an app called Calm, which was recommended to me by a yoga instructor. So far, it’s been really helpful. Go for combo training: I get more out of my workout if I do a combination type training, cardio mixed with weighs or plyometrics. So, if you see a tall woman with glasses dropping to the ground mid-run to do a few push-ups, that’s probably me. Keep it positive and move forward: Being a pessimist who holds onto grudges and has a semi-permanent evil witch/mom face is something I excel at, but it’s been a sucky existence and more of a defense than a part of the real me. If I can survive the birth of three kids and some of the other stuff I’ve dealt with, why am I so serious? I should be and finally learned to be grateful for everything, even the bad stuff. So that’s where I am right now. It’s taken a while to put this all into words. I’ve been dealing with a lot of stuff, but I’m still going, and remembering to DFQ.